Before we talk about upgrading your mashed potatoes, let’s start with the basics. First of all, make sure you’re using the right type of potatoes. 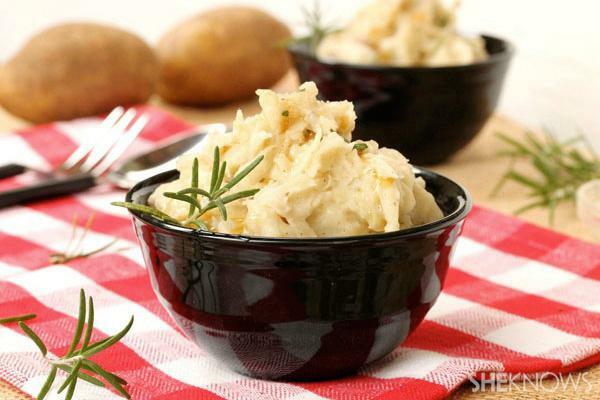 Avoid the red, waxy potatoes and use Russet potatoes or Idaho potatoes for the creamiest texture. If you’re looking for something a little different, Yukon Golds make golden mashed potatoes that have plenty of flavor. Peel the potatoes and cut them into chunks. Boil them for about 15 minutes, or until they are very tender. Drain the water and return them to the pot. Use a potato masher to mash them, then stir in the butter first and then warm milk (start with 1/2 cup and add more as needed) until they are a smooth and creamy in texture. Stir in salt and pepper to taste. Avoid the dreaded gluey mashed potatoes by mashing in the butter first and then the warmed up milk or cream. As you can see, the sky is the limit when it comes to add-ins for mashed potatoes. Have fun! This post was sponsored by Hannaford. Join them in the fight against hunger this holiday season with Hannaford Helps Fight Hunger.